After a morning of filling out paperwork, we all jumped into the party bus and drove down to PADI Headquarters. 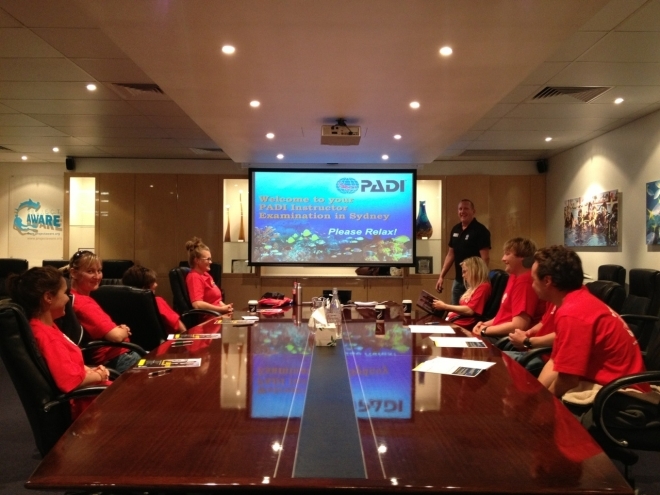 Our examiner, Thomas, greeted us and made us feel at ease as he led us into the PADI board room. After a quick orientation session on how the exam was going to run over the next few days, we started our theory exams. Friday 13th… Unlucky for some, lucky for others… We all passed our written exams. All that exam practice and revision sessions paid off and there was a huge sigh of relief as we made the journey back to Abyss to prepare our classroom presentations. By this stage, preparing presentations had become second nature, and we could do it in our sleep, so we all went away feeling pretty confident about the next day. Day 2: We met at the pool for our knowledge development presentation sessions in the morning. One by one we stood up in front of the class and delivered our presentations, ticking all the boxes and achieving awesome marks. 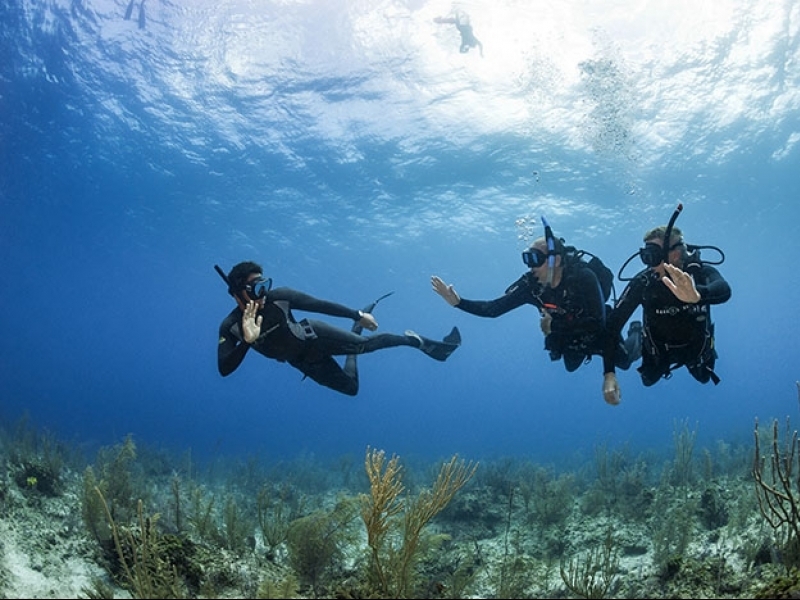 Day 3: We arrived at Shelley Beach, filled with excitement and nerves for what lay ahead of us – open water presentations!! It was pouring with rain but that didn’t dampen our spirits, we’re scuba divers, born to be wet! Our ocean presentations ran smoothly, as did our rescue scenarios, even though we were bombarded by the nippers doing their training session. After our debriefs, we were taken aside by Thomas one by one and our fate was revealed to us… As each person came back with huge smiles on our faces it became apparent that we had all done ourselves and our instructors proud!! We changed into our ‘instructor red’ t-shirts and took over the beach as we received our certificates and had photos taken. 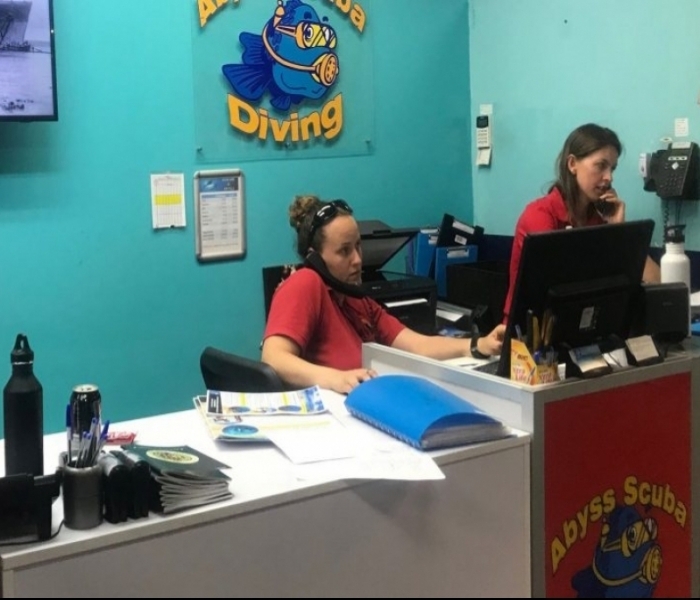 And bobs your uncle – Mission accomplished – Abyss had once again successfully prepared and trained up 8 instructors ready to take over the world!!! I for one, wouldn’t have been able to get through the IE if it wasn’t for everyone at Abyss supporting me the entire time, and special thanks go to Carl, who was extremely patient and put in lots of work after hours to lead study sessions to help with the dreaded physics! The IDC was an intense but thoroughly enjoyable 2 weeks, I met some amazing people, all who share the same passion for the underwater world. 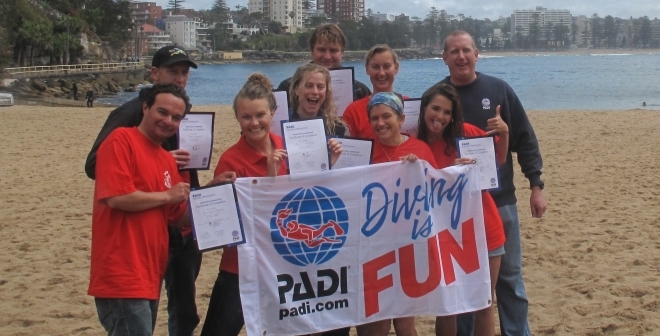 It was one of the most physically and emotionally challenging things I’ve ever done and completed, there were highs and lows, but at the end of it, I felt completely prepared and confident in my ability to not only pass the IE but to go on and teach diving to everyone. I still have a lot to learn, but I am continuing my education and career development with Abyss by going on to become an MSDT. I am loving teaching, finding it extremely rewarding and can’t wait to keep progressing through the ranks!